In January 1997, Tom and Ray Magliozzi, the Tappet Brothers of NPR's Car Talk, received an unusual phone call. A John from Houston wanted to pick their brains about the odd behavior of the government vehicle he was driving, and the car-savvy duo quickly realized he wasn't talking about a car. I work for the government, so I can't tell you too much, but I occasionally drive this government vehicle; it's one of those Rockwell things? And twice it's done a really funny thing I thought maybe you guys could help me with it. What Rockwell thing? You mean like a spaceship? The twice that I've driven this thing off the line, when I first start it up, it starts great. It starts really, really well, and it runs incredibly rough for the first two minutes. This is one of those puzzlers. After the first two minutes, after this really rough ride, there's kind of a jolt. And then it runs smooth for about six and a half minutes, and then at that point, the engine dies. John may have hoped to stump the radio hosts, but Click and Clack quickly put together the caller's identity. This was John Grunsfeld, who was, at the time, aboard the Space Shuttle Atlantis on a STS-81, a mission to Mir. They also insisted (probably in jest) that Grunsfeld owed them money from repairs they had done on his terrestrial vehicle. You can download the episode for 99 cents on iTunes. 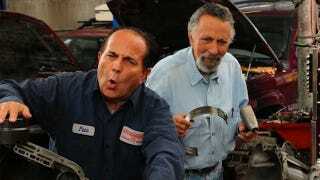 It's a pity Car Talk is ending this fall, but at least the Tappet Brothers have plenty of amusing episodes in their call bank. Top image from the Car Talk website.